A single machine license allows you to run Nsauditor on one computer. Note that you are allowed to audit, scan and monitor all computers in your network. 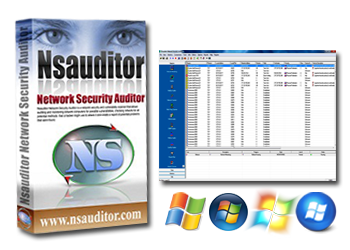 A 'multiple' machine license allows you to run Nsauditor on the number of machines as mentioned in the license type above. When registering, please write down the First name and Last Name that are required. They will be used to generate your registration key, which has the form XXXX-XXXX-XXXX-XXXX. The license key is licensed uniquely to you and has your customer details encrypted into it. You can install your new key by selecting the "Enter Registration Code" command from the Register menu in the Nsauditor Interface or go to the About dialog, and choose Register. Enter the First Name and Last name EXACTLY as before, then the registration code with the dashes (a good idea is to make a copy and paste from registration email ).